WVIA's ArtScene Calendar features events in northeastern PA, the Central Susquehanna Valley, the Poconos and the Lehigh Valley. We generally DO NOT accept events such as church bazaars, craft shows, charity dinners or "runs" or college visitations UNLESS there is entertainment or education content of interest to the public. Please be specific! Listings are collected from site visitors, arts organizations, venues, and educational institutions. All submissions will be reviewed and approved by an editor at WVIA before appearing on the site. WVIA reserves the right to edit any submissions. We do not, however, check the details of the event, and don't take responsibility for inaccurate information. Please contact the station if you notice inaccurate information in event listings. 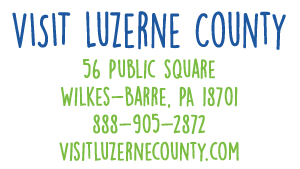 Luzerne County, you'll find it all right here in Northeast PA!! !